Jessie Churchill launched Looking at Painting Magazine in 2014 with the aim of using the extensive amount of research she has accumulated whilst studying to connect with and champion like-minded artists from her field. 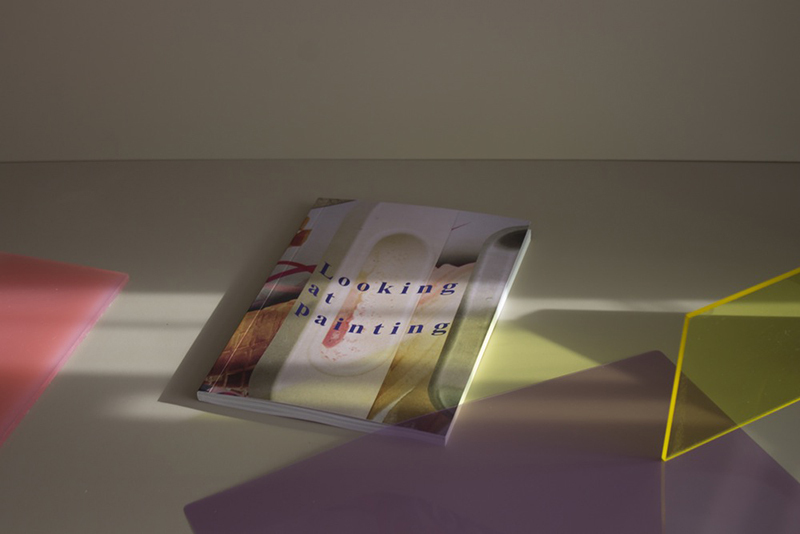 Having recently released it's second issue, Looking at Painting has achieved this and more! Showcasing the work of a varied and eclectic selection of artists, the journal shows how fine art is something that everyone can enjoy. How did the idea for starting your own magazine come to you? And how long did it take to make it a reality? The idea came while I was still studying sculpture; my approach to creating has always been very diverse. Using the elements of painting throughout my processes, in a less obvious sense, with elements such as colour, form and material. My interest stemmed from my ongoing practice, the actual magazine began originally with a research folder I made in a ring binder. While in the studio I would religiously photocopy artists I was inspired by daily, artists I thought displayed work in an interesting way, texts which interested me, texts which approached painting in the same way as me and texts which were more light hearted, less heavy in theory more active in doing. I wanted to make a book for an artist like me who wanted a more open and visual approach; hence the first journal contains a lot of artists I’ve personally worked with who share the same sensibilities. The making of the first journal was quite fluid because I had already collected the content, it took a few months to make and add to. Is there anything you wish you had known before you started the magazine? The first journal opens with a text by a friend of mine Natasha Ferguson, “Making sense of uncertainty: Not knowing as a desirable state”. I feel like this sets a president for how I approach the journal. I’m glad I didn’t know anything when I started, it’s easy to be put off by the cost and time elements, which can very easily stop you from starting a big project like this. Are there any milestones, which stick out for you since you published the first issue? Yes, the new journal is a personal milestone in the respect of size and design, which was a massive undertaking. Regarding my own practice, I have got to include some works in the journal, which are from artists who were a big inspiration to me from early in my career. What are your highlights from issue 2? Artist wise I set off to create a journal, which approaches art from all different techniques and angles. So I would say there is no one highlight in that sense, as I think every page together makes it a whole. An overall highlight of this design is creating a publication where I can show full works as full pages, where images aren’t a decoration to text. Focusing on the works, as they would be seen individually. An example of this is Jessica Simorte’s and Stella Corkery’s pages. With the layout of continuous full size images it is entered like a sketchbook. When did you first become interested in fine art? At high school originally I had a teacher who was very supportive in the idea that art doesn’t have to be a perfect copy of a painting or drawing. But more anything creative is positive, which is my sort of mantra in a way. To pinpoint the moment I realised I wanted to continue indefinitely, I think that was while studying at the Estonian Academy of Arts. The tutors open attitude to art education, by letting you join ceramic, graphic design, architecture and various electives, I realised arts in general is something I would always continue and would be always something I find intrigue in. Can you tell me a bit more about yourself as an artist? I myself am a practicing artist; I work mainly on installations drawing together lots of different techniques and materials. I also work daily as a graphic designer and illustrator so I have a collective mix. Modern art isn’t always thought of as the most accessible art form. Why do you think this is? Maybe it’s the traditional idea that you have to “learn” specifically modern art. In the volumes I select artists who come from all different backgrounds in their approach to creating work, graphic designers who work in the field, artists who run alongside their day job which could be in a different profession, ceramicists, joiners. That is the point I wanted to put across, you can be interested in art and make your idea of art without having to fit into a specific trodden track. I think as a reality that is “modern art” as I feel it’s a more realistic understanding. I think Looking at Painting bridges the gap between fine art and other design specialisms and makes it a much more easily accessible - was this an objective from the beginning? Yes, all different approaches and outlets inspire me. It’s true to my own experience and I know it’s that of my friends and peers. It’s crazy to think interests can’t crossover, so on a basic level I wanted to show how my inspiration crosses over and make a journal, which gives easy access to a whole wonder of different disciplines. In one easy place. I am very much into the idea of the journal been a reference book to duck in and out of. Do you think contemporary fine art has a prominent enough role in education? If you could pick one artist to introduce into the school curriculum, who would it be? I think from my own experience at school a well-rounded approach is the key. “Contemporary art” I see as just another way to say the current, so I think its great if schools keep their finger on the pulse. I also think crafts have a prominent place in contemporary art, I hope this journal shows I really respect skill, ceramic, metalwork, transferable skills. I think a rounded education is the key – so young people can decide what angle they take and be aware of all the paths they can take creatively. If I could introduce one artist, it would be one from the journal – Lauren Keeley. I think her approach to painting is so interesting. Its very fresh in design and very striking but it also uses so much skill of inlaying wood and construction. It shows how a traditional skill is still fun and visually very modern. A skill also which is great to learn and even those kids who don’t feel so confident in the drawing and painting side of things can approach creating in a technical and skill based way! Finally, what is next for you and for Looking At Painting? I am currently working on a book of my photo works, which I have created over the past 2 years. It will be released later this year through the publishers that I created. As always I’m continuing my own art practice, which is a daily thing for me. For looking at painting I am working on some smaller publications and preparing for some exciting projects and book fairs.